This system is quite interesting because it has been improved and upgraded several times. At least nine different models are known to exist, all of which remain on the initial design (PP-2 if not PP-1). Little is known about the first model (PP-1), which dates late 1974. All we know is that it was nearly same as model PP-2 below, and may differ only by one or a few improvements in the electronic circuits (cleaner video signals, etc). Although model PP-2 is labeled Zanussi Ping-O-Tronic on the top side, models PP-4 and PP-5 are known to exist as Seleco Ping-O-Tronic. As a matter of fact, Seleco was a trademark of the Zanussi Industries. Other models like PP-6 only show "Ping-O-Tronic" without trademark. We currently ignore if both Seleco and Zanussi labels were used for a same model. Interestingly, models PP-5 and later have an additional 5-pin DIN plug on their left side to connect the Gun-O-Tronic accessory, which allows playing a target shooting game, which almost no other analog system plays. 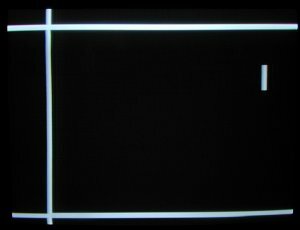 So far as we know, the only other analog games which played target shooting games were the Magnavox Odyssey and the Philips Tele-Spiel ES-2201. Technically, it is not possible to connect just a light censor to the existing Ping-O-Tronic because the original design did not allow hiding the paddles, resizing the target, and disable it once shot. Therefore, the original design was slightly modified with a small electronic circuit allowing to do the necessary management to play a target shooting game. 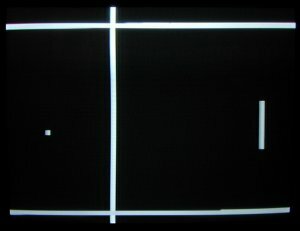 Gun-O-Tronic used its own electronic circuit to detect the light of the target: when connecting it to the unit, the paddles and boundaries disappear, leaving only the target on the screen (which is the ball but four times bigger than usual). Trying to date a system using date codes on the electronic components is not always reliable. Here, our Seleco PP-4 has a serial of E21 12805 whereas our Zanussi PP-2 has a serial of C21 17424. However, the three chips of the former (date codes: 7418) are one year earlier than those of the latter (date codes: 7518). The use of one or two year old chips was a common thing at this time and the date codes cannot precisely date a game. 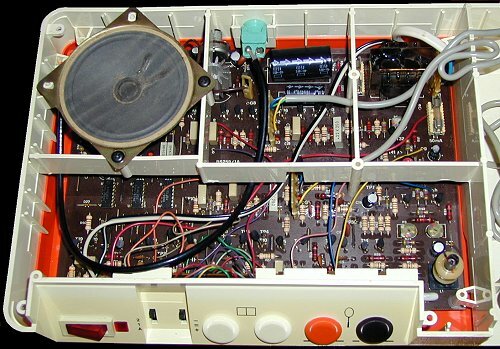 However, the same user manual was used for all Ping-O-Tronic models and its printer date code of May 1975 indicate that the first model was released in mid-1975. Also, the additional paper provided with models PP-5 and later to advertise the Gun-O-Tronic add-on dates September 1975, which indicates that model PP-5 was released during that month at the earliest. Several details remain to be understood with these games. Still, they are very interesting examples of how early video game systems were designed. Like the First Dimension FD-3000 and Executive Games Face Off, they were improved and eventually upgraded by the time, hence several models. This obviously stopped with the next generation games based on a dedicated chip. 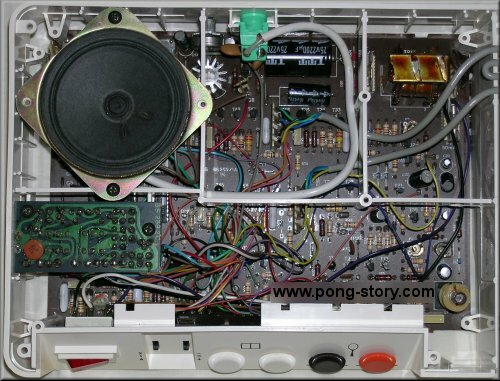 Inside Ping-O-Tronic PP-2: discrete components, and no Gun-O-Tronic plug yet. The only three chips used in the game. is set to its biggest size. 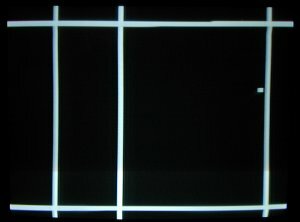 The left paddle is set to an infinite height so as to form a wall. Maybe the only time we see this "game": it requires no players ! bounces on them or the horizontal boundaries. no additional components than those required to play Tennis.